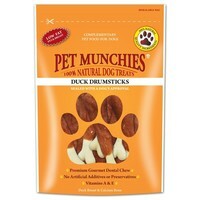 Pet Munchies Duck Drumsticks for Dogs are superior gourmet dental treats made from 100% natural duck breast meat wrapped around a delicious calcium bone. Designed to satisfy your dog's natural instinct to chew, the treats are naturally low in fat and can help to reduce plaque and tartar for healthy teeth and gums. With vitamins A & E and no artificial colours or flavours, Pet Munchies Duck Drumsticks are a perfectly nutritious and tasty treat for pups over the age of 4 months and growing dogs.